I absolutely love this brewery’s logo. It’s hard to imagine something more badass than a bear and lion about to throw down in a bare-knuckles boxing match. Oh yeah, they make some pretty good beer as well. 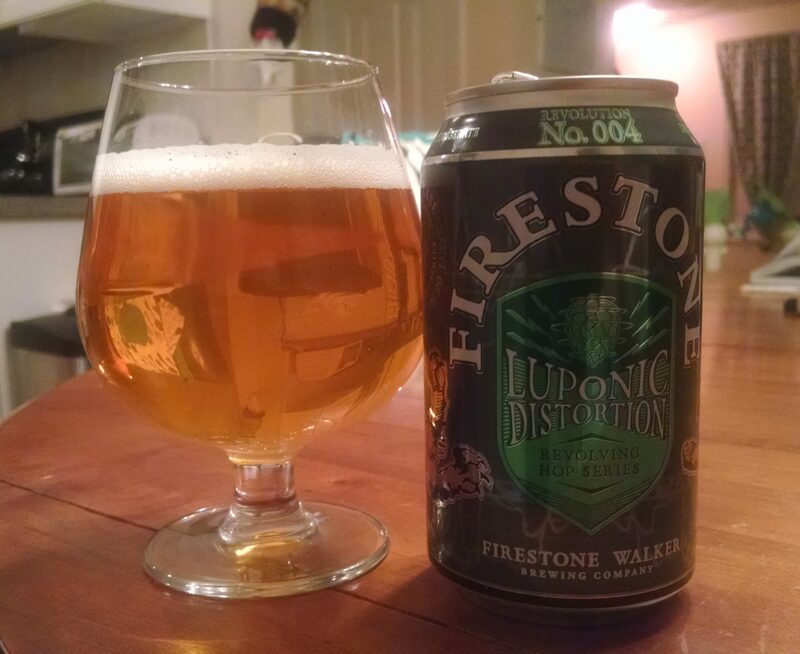 Description: The fourth installment in a series of IPAs brewed with a revolving set of hops. For this particular beer they used a combination of four South African varieties. You can find out a lot more information about this project on the brewery’s website. My can was dated 11/15/2016 and I had right around it’s two month birthday (this post got backlogged a bit). Appearance: Translucent straw yellow/amber body topped off by a fizzy white head. Smell: Crisp, piney bitterness with a little bit of sweetness mixed in. Taste: Very clean and crisp. Light tropical sweetness upfront, with a crackery malt and piney hop finish. The flavors were very balanced and smooth as opposed to aggressive bursts of fruit and bitterness. Hype: This brewery does tend to garner some attention, though I don’t believe there was much hype around this particular release. It was, however, yet another one of the beers recommended to my wife around the holidays so I was once again curious to see how well the shop steered her. Overall: I liked this a lot. Light and refreshing, I enjoyed the departure from the hazy juice-driven IPAs I’ve been drinking a lot of lately. A very pleasant reminder of just how good other approaches to this style can be. Will be keeping an eye for future releases in this series. 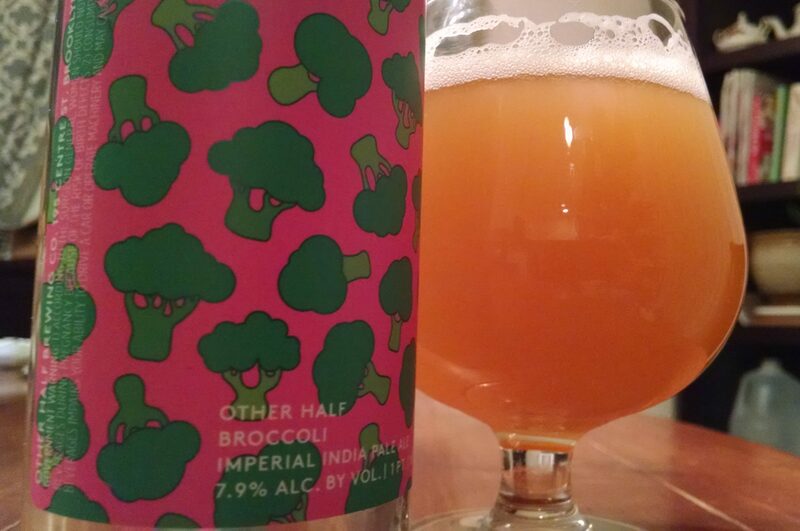 The final review coming out of my visit to Idle Hands last weekend takes me back to a beer I’ve mentioned on the blog before. Way back in December 2015, while Idles Hands was brewing at Night Shift’s facility, I had a sample of this and found it somewhat perplexing. Since I had a chance to try it again, and in the process reboot my stout season, I figured I might as well. Description: Listed as a stout featuring notes of coffee combined with pine and citrus. My tall 16 oz. serving cost $7.50. Appearance: Poured the expected black body topped off by about a finger-plus of light tan foam. Smell: Primarily roasted malt with a mild fruity sweetness lingering in the background. Taste: Fairly strong roasted coffee notes throughout, though there were definite peaks at the start and end of the beer. There was a bit of citrusy sweetness in the middle, but I found it mostly overshadowed by the opening and then buried by the finishing combination of roast and piney bitterness. Hype: I was just really curious to try this out again as a full pour. Overall: Didn’t hate it, but I don’t think I would get this again either. An interesting concept, kind of like a pale ale/coffee stout hybrid, that wasn’t really enough of either. The roast came on a bit too strong for my preferences and in combination with the piney bitterness was just a bit much. Random Dune Quotes, or What Would Muad’dib Do? 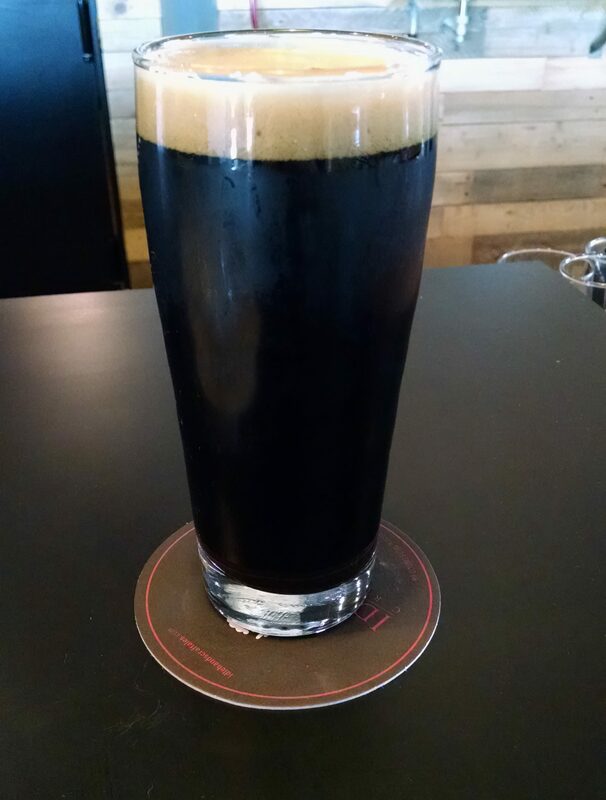 My next Idle Hands brew was tapped the morning of my visit and gave me an excellent chance to jump back into my winter goal of drinking more heavy, dark beer. Description: Listed as an oak barrel aged Belgian dark ale, it was said to feature notes of dark chocolate, sour cherry, and coffee on their menu. My 13 oz. pour cost $8.50. Appearance: Black body with a thick tan foam across the top. Smell: Sweetly tart, with hints of rich dark malt. Taste: Started out strong with sour cherries and gradually eased up to reveal more subtle notes of dark malts, coffee, and bittersweet chocolate. The finish was moderately tart with a hint of oak. Mouthfeel: Body was just a few ticks over medium. Pretty low-level carbonation. Hype: I don’t know about hype necessarily, but this did get put on tap for the brewery’s showing of the New England Patriots playoff game that evening. Kind of an ironic name considering they were supporting the Patriots, but I’ll go with it. Overall: I liked this a lot. Not a style I drink very often, but I really enjoyed how the tartness paired with the dark malt influences. Another one I recommend checking out while it’s around. 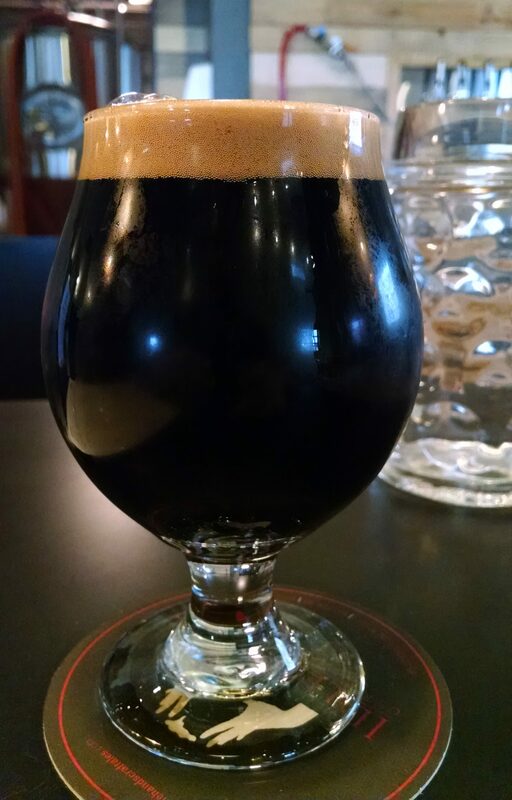 I stopped by the Idle Hands taproom this past weekend to get out for a bit and to try a few things from their increasingly intriguing tap list. I had a few post worthy beers in my time there and wanted to start the week off with favorite of the day. Description: The next installment in the Kill Your Idles fruited sour series. This one was a sour ale brewed with strawberries, raspberries, and added lactose that the brewers describe as slightly tart and super jammy! It was tapped only a few days before my visit so I got this one while it was nice and fresh. Cost was $6.50 for a 13 oz. pour. Appearance: Light red body with a thin lacing of white foam. Smell: Huge burst of tart berries. Taste: Even split between strawberries and raspberries upfront with a pleasant tart sweetness. The finish became slightly more tart and offered up subtle hints of lactose and acidity. Ultimately, I want to say the strawberries won out over the raspberries as the beer went on, but the influence of each was very clear throughout and made for an excellent combination. Very fruity and refreshing. Mouthfeel: The body was light for the most part, though it did take on a syrupy feeling mid-sip. The carbonation was mostly evident on the finish as little bubbles gave each sip a tingly send-off. Hype: I could tell the brewery was pretty proud of this one by the way they advertised it on social media and how the bartenders discussed it. Tapping it this weekend was also meant to showcase the brew in advance of a bottling run. Overall: I really enjoyed this. Loved the light, refreshing berry flavors and it had just the right amount of complimentary tartness. Made me sad that I missed out on the Blood Orange version a few weeks ago, though I certainly will keep an eye out for the next release. Highly recommend giving this a try. Checking in with the final review from my New Jersey haul. Feeling very fortunate to have received so much great beer this past holiday season. Description: We’re 3 for 3 in having to go to social media for more info on my Mid-Atlantic brews. Per Instagram, this Imperial IPA was brewed with a mix of Mosaic, Simcoe, Hallertau Blanc and Cascade hops. My can was dated 12/15/2016 and I opened almost exactly one month later. Appearance: Poured a hazy yellowish-orange body with a thick white foamy head that left some impressive lacing on the sides of the glass as I drank the beer down. Smell: Juicy sweetness backed up by a sticky hop bitterness. Taste: Lots of tropical fruit upfront, with mango standing out pretty clearly above more mellow hints of pineapple, melon, and perhaps a bit of grapefruit that snuck in. The finish brought on a strong mix of grassy bitterness beneath a mostly sticky and resinous hop profile. While not overly boozy, this did taste pretty much on par with the ABV. Mouthfeel: Medium bodied overall, the beer managed to feel sticky, creamy, and fluffy all at once. The carbonation level was moderate and the playful bubbles really accentuated the various tastes quite nicely. Hype: Elevated. I tend to equate this brewery with Trillium in my mind, probably in no small part due my first experiences with them outside of a beer festival having been a collaboration between the two. Overall: Very good beer, one that I would appropriately enough put on par with my last few Trillium offerings. I’ve been absolutely spoiled in the DIPA department this past month. A gift from a friend in New Jersey that also served as my introduction to this brewery. Description: I had a tough time tracking down more official information on this, so here’s a nice pic of some cans from the brewery’s Instagram feed with a few details. As you might suspect by the name, this single-hopped Double (or “Extra” as they call it) IPA was brewed to feature the wonders of the Mosaic hop. Appearance: Cloudy dark yellow and amber body with a slight covering of white foam. Smell: Huge burst of tropical fruits on the pour that remained pretty consistent throughout. Taste: Tons more fruit upfront, primarily tangerine and grapefruit in that order of potency. Light, grassy hops on the finish gave this a smooth closing bitterness. Very clean and fresh, the alcohol content surprisingly well hidden. Mouthfeel: Fluffy body with just a little bit more than moderate carbonation. Hype: Of the beers I came home with, I was perhaps the most curious about this one as I hadn’t really heard much about this brewery. Overall: This felt like the kind of beer I could drink all day. It tasted fantastic and drank more like a really good session IPA than something pushing 8%. Delicious and refreshing, check this out if you can. Definitely open to trying out more from SØLE. The book centers on Billy Harrow, a curator at the Natural History Museum in roughly present day London. Billy specializes in preservation and one of his most recent efforts, a massive forty-foot squid, has become one of the museum’s premier attractions. We meet him when he discovers, while leading a tour group, that his prized specimen has disappeared without a trace, display case and all. As the investigation into the missing squid gets underway, Billy finds that he has become a person of interest for the police; or at least to the detectives from the mysterious Fundamentalist and Sect-Related Crime Unit. Before long the situation escalates beyond Billy’s wildest imagination, as he is dragged into a side of London he never even suspected to exist; an occult metropolis hiding in plain sight populated with magical persons, supernatural creatures, and Kraken-worshiping cultists, all of whom are bracing themselves for the coming apocalypse. I liked this book, though it was not without its flaws. There were times I thought the story was muddled and difficult to follow, and other points where I thought it felt either rushed or aimless. Also worth noting, the book doesn’t quite live up the superlatives used to advertise it. While it did have its strange and funny moments, it was not in the slightest bit scary or suspenseful. If a book called Kraken teases horror, I feel like that sets a certain expectation; one this work did not deliver on. Sure people die, and it dealt with the potential end of the world, but this was by no means a dark or scary book. Or maybe I’m just not the audience those appeals were intended to lure in. Putting that aside, these criticisms ultimately didn’t interfere significantly with my overall enjoyment of the story. It was fun riding along with Billy as he got swept up in the events of the novel, and I remained interested in the characters and plot twists even when things got a bit confusing. There were plenty of humorous moments along the way: the colorful language of Collingswood, the peculiarities of a familiars strike, an amusing revelation about Billy, and yet another reason to never, ever use transporter technology (as if that scene in Star Trek: The Motion Picture and the delightfully grim songs in the Hitchhiker’s Guide weren’t enough already). The book was just fine for what it was, but don’t quite get why such a big deal seems to have been made about it. For my next stout I am drinking a gift beer I received from friends in New Jersey a couple of weeks ago. Nothing like coming home from a long trip with new beer to try. Just for the fun of it, I paired my Brix with (Lego) bricks. Description: I had to do some digging to find out more information on this beer. Per the brewery’s Instagram feed, they took their base stout and added Sidamo coffee at a rate of 2 pounds per barrel. Appearance: Poured a thick dark brown/black body with about a finger and half of light tan foamy head. Smell: Lightly roasted coffee with just a hint of sweetness. Taste: Pretty much exactly as advertised by the smell and very nearly a cup of good coffee in beer form. Lots of light roast coffee upfront followed by a nice little bit of creamy sweetness on the finish to even things out. I took my time drinking this and was pleasantly rewarded for doing so as the flavors really came out after the beer sat in the glass a few minutes. 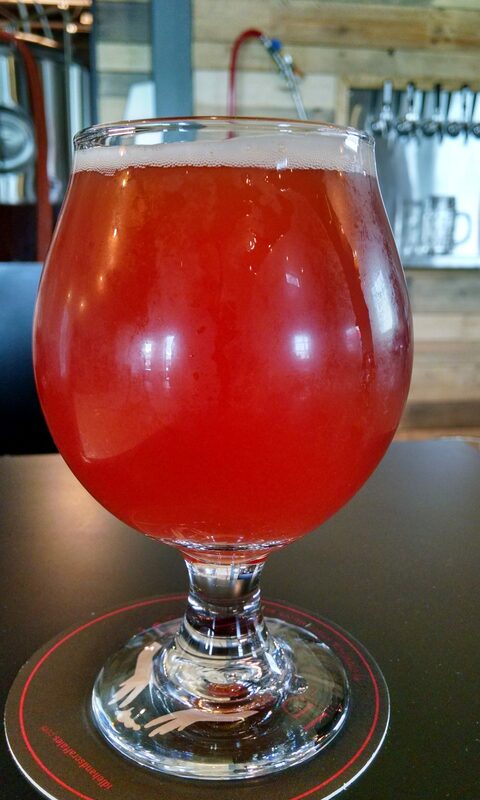 Mouthfeel: Thick and smooth with a pretty subdued carbonation level. Hype: I was excited to try this. I had read good things about it on my Untappd feed and it gave me something from outside my home market to add to my stout lineup this winter. As always (full disclosure) knowing one of the brewers made it pretty special as well. Overall: Very nice beer that absolutely nailed the style. It had just the right amount of roast for my tastes (moderate) and the ending sweetness really brought it all home. 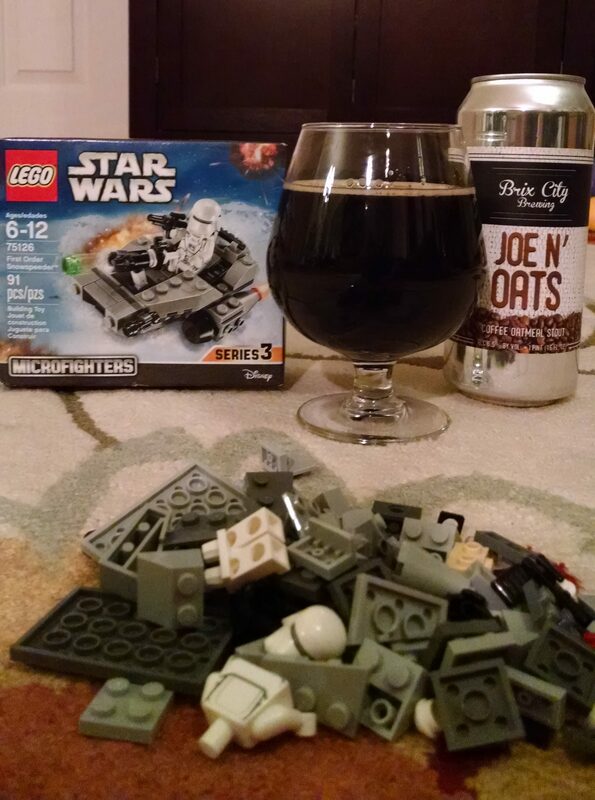 It was a great pick-me-up on a cold night and offered nice way to get my stout fix in at a reasonable ABV. The second to last 2016 Barrel Society review is finally here! I’ve been looking forward to getting these last two reviews in and now that things have quieted down a bit I am finally able to sit down and get to it. Description: A brett saison brewed with blackberries and meyer lemons, bottled in the first half of December 2016. 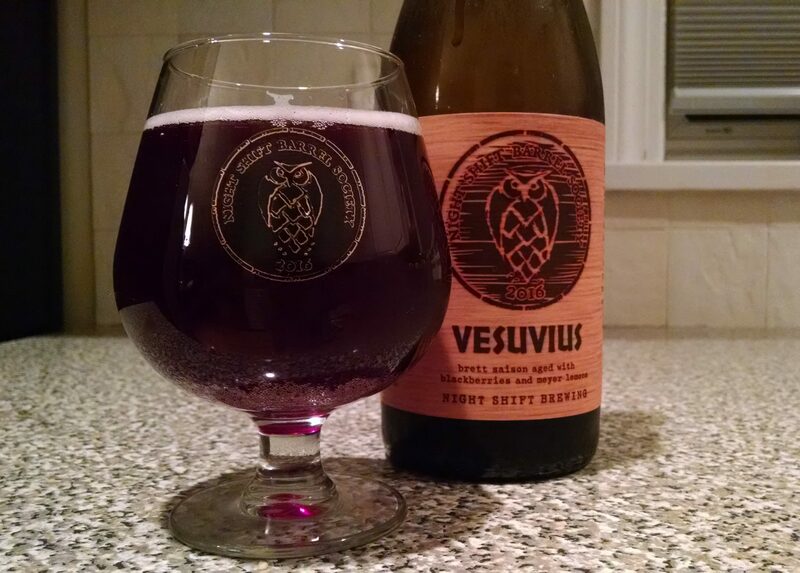 To quote the brewer’s notes: pours magenta in color; strong aromas of blackberry jam, barnyard funk, and sweet lemon; sips with bright citrus notes and rich berry flavors; finishes oaky and tart. Appearance: Deep ruby/purple body topped off by a thin pinkish-light purple head. Smell: Mainly tart berries with a bit of sweetness. Taste: There was a lot going on here. The beer started out with a mixture of sweet and tart blueberries before transitioning towards a blend of lemon and peppery yeast. The finish had a dryness to it that made me think of red wine and featured a light hay-like funkiness mild oak barrel influence that gradually built up as the beer went on. Mouthfeel: The body was on the thicker side and a bit syrupy. Moderate-plus carbonation. Hype: Usual excitement for a barrel society release. Maybe a little bit more since I’d been putting this one-off for a bit. 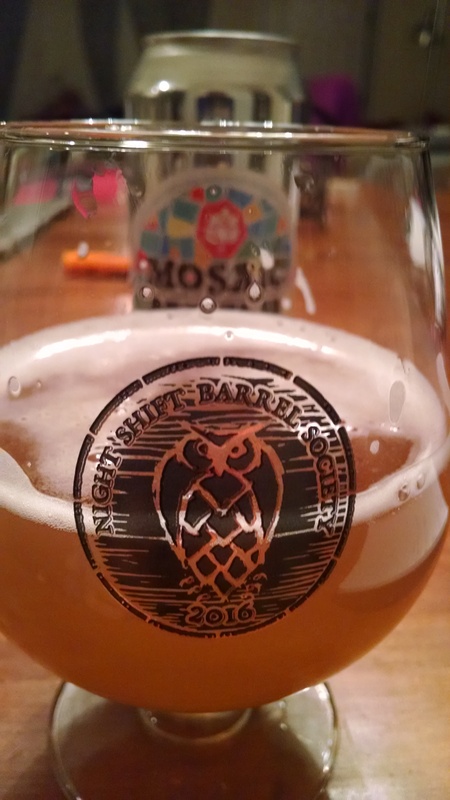 Overall: An excellent brew that I definitely enjoyed taking my time with. Saisons tend to take me outside my comfort zone a bit, and this one did so in a very enjoyable manner. Fantastic blend of tastes.